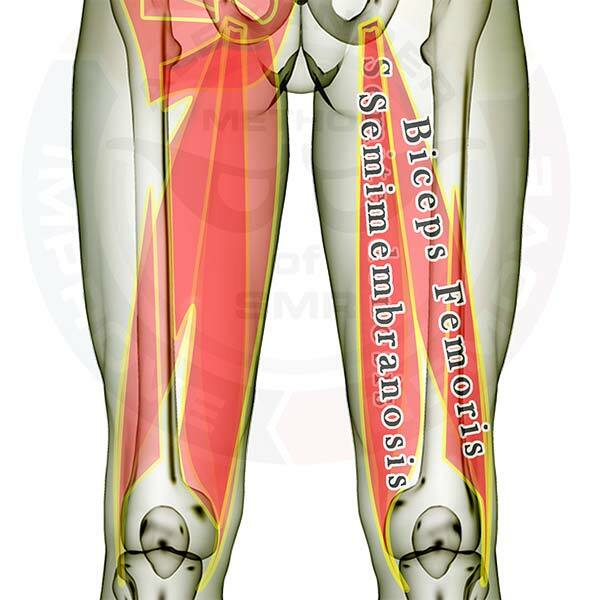 Pictured above is the biceps femoris. You'll notice there are two attachments above the knee that feed into the same tendon below the knee (one on the hip bone, one on the lower portion of the thigh bone). The leg on the right has the biceps femoris labeled. The leg on the left displays all the muscles you can address on the back of your thigh in portions of the region of the biceps femoris. All of the muscles in the left leg are see-through so that you can appreciate the location and size of each muscle relative to the others.